Interested in learning how to ride horses? At Mystic Valley Farm, I focus on improving your horse riding abilities through strengthening your equitation skills. Part of this process involves increasing your awareness of the horse and their strengths and weaknesses. I work with the horse and rider together in order to develop a properly muscled horse that has the ability to carry a balanced rider. Meet the school horses we currently have available for lessons. Unifying the horse and rider is the equestrian experience I strive to encourage. Ride either English or western tack. Being properly dressed is important, see required horseback riding attire . Beginner and Intermediate Horseback Riding Lessons - Spring Special! Private and semi-private horse back riding lessons are currently available at our riding school. Semi-private on MVF horses $150 - 1+ hour total for two riders and two horses. Beginner Semi-private lesson, 3 lessons, package for $330 - 1+ hour: 2 riders will share one horse, watch, ride and learn together. Beginner group lesson, 3 lessons, package for $390 - 90 minutes: 3 riders will trade off riding 1-2 horse(s), watch, ride and learn together. Ground Manners and horse handling skills - you will learn the basics of catching, haltering, leading, grooming, saddling & bridling the horse. Basic Riding Skills - learn how to adjust your tack, mount and dismount your horse. A large focus will be placed on strengthening your riding position (equitation), and how to use your "aids" to communicate to the horse. Riding all Three Gaits - the long-term goal of the beginner & intermediate rider will be to ride all three gaits: walk, trot and canter. Including, maintaining good equitation and providing proper "aids" upon the horse to have smooth transitions between gaits. Riding Basic Patterns - In addition to riding all the gaits, you will be schooled on riding patterns. These patterns such as circles & serpentines, will employ and strengthen your riding skills and position so you can become an effective rider, not just a passenger. Once riders have gained confidence and skills to ride independently, riders will be joined with an instructor for open field and farm road riding. Riders will walk, trot and possibly canter in field and on county farm roads. 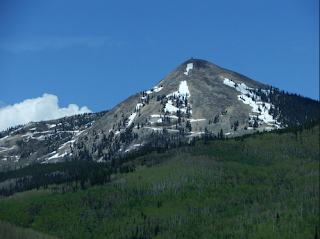 Enjoy beautiful North Routt vistas of Hahns Peak, Farwell Mountain, Sand Mountain and other majestic country scenery. Lessons and training are also available for more advanced riders and their horses. If you are looking for training of your horse. Please contact me so we can talk about your horse training goals.